‘Prekäre Arbeit & Selbstorganisation’ in Kunst- & Gesellschaftsarbeit – Wem gehört die Kunst? 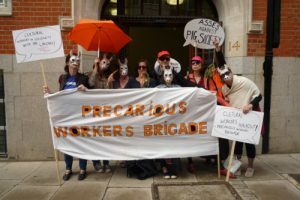 “We are a UK-based group of precarious workers in culture & education. We call out in solidarity with all those struggling to make a living in this climate of instability and enforced austerity.